There in a village lived an orphan with his grandmother. Everyone called him Wainąnįka, which means "Little Orphan." The other children when they saw him would tease him by saying, O wainąnįkra ixąžireną, "Oh, the little orphan is going by again." Nevertheless, he was a good child and always did what his grandmother asked him. So one day his grandmother told him it was time for him to fast and to seek a dream from the spirits, so the orphan blackened his face and went out to the wilderness to make himself pitiable before the spirits. Night after night the orphan would return home, and every time his grandmother would ask, "Did you dream and receive a blessing, grandson?" Even though four times he fasted four days and nights, and nearly fasted himself to death, he did not receive a blessing from the spirits. Indeed, he never received one. In time he reached the age when he would be expected to go out on the warpath, so he went out to fast again. He felt discouraged and thought that the spirits denied him blessings because they were so much like humans that they felt towards him the same way that the villagers did. Nevertheless, he went to the wilderness and cried out to the Thunders that they might take pity on him and bless him. For four days and four nights he ate and drank nothing, indeed he did not even put so much as a pebble in his mouth; but on the fifth day he was so thirsty that he broke his fast to take a drink. As the orphan neared the spring he saw something. There, unexpectedly, was a dirty, emaciated horse laying in the mud. He had always desired a horse, but his grandmother was too poor to own one. When Little Orphan saw the horse he took pity on it. He fetched water for its parched lips, and rich green grass to sate its hunger. He brushed the dirt from its hide and kept bringing armfuls of grass so that he would have plenty to eat. Then he promised the horse that he would soon return after he had seen his grandmother. When he arrived at his grandmother's, she asked, "Grandson, did you dream?" Again he had to answer "No," but he added, "I found a horse lying by the spring." He told her how he had almost fasted to death, and how he had sought the blessings of the Thunderbirds; but that on the fifth day he had to seek water, and that was how he found the horse. His grandmother told him that he should always help those who cannot help themselves, so he returned every day and supplied the horse with water and feed, nursing him back to health. Finally, he was able to lead the horse back to his lodge. When some people saw him leading this bag of bones home, they mocked him and said, "Now Little Orphan owns a horse!" The boy tried with all his power to fatten the horse up, but no matter how much grass he gathered, the horse always seemed ugly, and so bony that it looked as if his skeleton would pierce right through his skin. 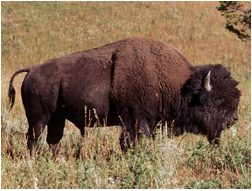 At this time a number of men had gone out on a hunting expedition, and now they returned with the news that a great herd of buffalo was headed their way and would be there in about four nights. Scouts were sent out to find a good place to hunt the buffalo herd, and when they came back they had unexpected news: among the herd was a buffalo whose hide was as white as snow. It was very holy. The chief greatly coveted the hide of this animal, and had his criers announce that whoever could bring him that hide would receive his daughter's hand in marriage. The orphan greatly loved the yųgiwi (princess), and she in turn had not failed to notice him. The orphan went home and told his grandmother everything. He declared that he too would try to kill the white buffalo. The hunters decided to wait until the buffalo were just one night's travel away, then they would launch their expedition. The boy decided to take his new found horse on the hunt with him. The next day he led his horse to water as usual, then he took him to green pastures. All the while the orphan seemed quiet and contemplative. As they were walking along, unexpectedly, he heard a voice nearby say quite distinctly, "Well nephew, why are you so quiet?" It seemed as if the voice had come from the horse, but he could not believe that such a thing was possible. Just the same, the boy decided to answer the question in order to find out where the voice was really coming from: "I was thinking about the hunt and how hard it will be to get the white buffalo. Indeed, it will be very difficult." Then the voice was heard again: "Nephew, if that is what you want, then we shall get it." Then he knew it. The voice was indeed that of the horse, and he thought to himself, "This horse is truly wákąčąk (holy)." The boy now looked for a particularly good pasture, as they would be going on the hunt the next day. As they were heading back to his grandmother's lodge, the horse said, "Nephew, what you have heard only you have heard and no one else, so do not speak of it." The orphan replied, "All right." The next morning he went to where the men had gathered for the hunt. There they waited for the Bear Clan to give the order for the hunt to begin. Then the horse said to him, "Nephew, now you may get on me, but be sure to sit tight, and whatever happens, remain seated as you are." The Bear clansmen gave the signal for the hunt to begin, and everyone galloped off on their horses. No one paid much attention to the orphan, but when the signal had been given, his horse seemed to disappear. As the hunters finally began to get near the great buffalo herd, there, unexpectedly, to their great astonishment, was the orphan riding back. In his hand was the hide of the white buffalo. Thus the orphan won the prize of the princess. Great was the rejoicing of the village, for many buffalo were killed and there was meat aplenty. Then the boy went to his horse and asked him, "Uncle, who are you?" The horse replied, "Hohó, nephew, you nearly fasted to death and we knew it. We took pity on you, and I came as a blessing to you. This very day at sunset I shall depart; but look in the direction of the setting sun and it shall be made known to you who I am." Thus did the horse speak, then he vanished. Commentary. Little Orphan belonged to the Lower Moiety. The Thunder-horse called him "nephew" (sister's son), which implied some kind of affiliation between him and the boy's mother. Given this affinity and the rule of cross-moiety marriage, it follows that the orphan's father was of the Lower Moiety. Since clan and moiety are patrilineal, it follows that Little Orphan was of the same moiety as his father. Among the American Indians the horse was a relative newcomer, so the mythology of the horse was very much a work in progress. It is very interesting to see that it was beginning to look in some respects like some of the equine mythology of Europe. In Greece, the great white horse Pegasos who helped the hero Bellerophon, was also said to have carried the lightning bolts for Zeus.3 Such a white horse that courses the heavens with thunderbolts is very close to the thunder-horse of the present story. Stories: mentioning horses: The Big Eater, Thunderbird and White Horse, Sun and the Big Eater, Rich Man, Boy, and Horse, Hare Recruits Game Animals for Humans, The Horse Spirit of Eagle Heights, Trickster Takes Little Fox for a Ride, James’ Horse, The Boy who was Blessed by a Mountain Lion, The Boy who Flew, Pete Dupeé and the Ghosts, They Owe a Bullet, The Man Whose Wife was Captured (v. 2); mentioning Thunderbirds: The Thunderbird, Waruǧábᵉra, How the Thunders Met the Nights, The Boy who was Captured by the Bad Thunderbirds, Traveler and the Thunderbird War, The Boulders of Devil's Lake, Thunderbird and White Horse, Bluehorn's Nephews, How the Hills and Valleys were Formed (vv. 1, 2), The Man who was a Reincarnated Thunderbird, The Thunder Charm, The Lost Blanket, The Twins Disobey Their Father, The Thunderbird Clan Origin Myth, Story of the Thunder Names, The Hawk Clan Origin Myth, Eagle Clan Origin Myth, Pigeon Clan Origins, Bird Clan Origin Myth, Adventures of Redhorn's Sons, Brave Man, Ocean Duck, Turtle's Warparty, The Daughter-in-Law's Jealousy, The Quail Hunter, Heną́ga and Star Girl, The Twins Join Redhorn's Warparty, Redhorn's Sons, The Dipper, The Stone that Became a Frog, The Race for the Chief's Daughter, Redhorn Contests the Giants, The Sons of Redhorn Find Their Father, The Warbundle of the Eight Generations, Medicine Rite Foundation Myth, Origin of the Hočąk Chief, The Spirit of Gambling, Wolf Clan Origin Myth, Aračgéga's Blessings, Kunu's Warpath, The Glory of the Morning, The Nightspirits Bless Čiwoit’éhiga, The Green Waterspirit of the Wisconsin Dells, A Waterspirit Blesses Mąnį́xete’ų́ga, Baldheaded Warclub Origin Myth, The Big Stone, Pete Dupeé and the Ghosts, Song to Earthmaker, The Origins of the Milky Way; about buffaloes and Buffalo Spirits: Buffalo Clan Origin Myth, Eats the Stinking Part of the Deer Ankle, The Blessings of the Buffalo Spirits, White Fisher, Brass and Red Bear Boy, Bluehorn Rescues His Sister, Bluehorn's Nephews, Redhorn's Father, The Woman who became an Ant, Buffalo Dance Origin Myth, The Buffalo's Walk, Trickster's Buffalo Hunt, The Blessing of Šokeboka, The Creation of the World (v. 3), The Annihilation of the Hočągara I, The Medicine Rite Foundation Myth, The Red Feather, Wazųka, The Stench-Earth Medicine Origin Myth, Holy One and His Brother, Old Man and Wears White Feather; mentioning white buffalo: Eats the Stinking Part of the Deer Ankle, Brass and Red Bear Boy, Thunderbird and White Horse; mentioning springs: Trail Spring, Vita Spring, Merrill Springs, Big Spring and White Clay Spring, The Resurrection of the Chief's Daughter, Bear Clan Origin Myth, vv. 6, 8, Bird Clan Origin Myth, The Woman Who Fought the Bear, Bluehorn's Nephews, Blue Mounds, The Boy who was Blessed by a Mountain Lion, The Lost Child, Old Man and Wears White Feather, The Wild Rose, The Omahas who turned into Snakes, The Two Brothers, Snowshoe Strings, The Daughter-in-Law's Jealousy, Eats the Stinking Part of the Deer Ankle, How the Thunders Met the Nights, The Nannyberry Picker, Rich Man, Boy, and Horse, The Two Boys, Waruǧábᵉra, Wazųka, The Man Who Fell from the Sky, Turtle and the Witches. This story is a variant of the second part of Thunderbird and White Horse. Themes: someone fasts a long time without receiving a blessing: The Seer, Earthmaker Blesses Wagíšega (Wešgíšega), The Man Who Would Dream of Mą’ųna, The Boy Who Became a Robin, The Nightspirits Bless Jobenągiwįxka; only when someone breaks his fast does he receive a blessing from the spirits: The Man with Two Heads; a spirit presents himself in an ugly guise: The Skunk Origin Myth; a chief offers his daughter in marriage in exchange for the hide of a very rare and beautiful animal: The Red Feather, Thunderbird and White Horse; marriage to a yųgiwi (princess): The Nannyberry Picker, Baldheaded Warclub Origin Myth, The Race for the Chief's Daughter, The Daughter-in-Law's Jealousy, The Big Stone, Partridge's Older Brother, Redhorn's Sons, The Seduction of Redhorn's Son, The Resurrection of the Chief's Daughter, River Child and the Waterspirit of Devil's Lake, The Roaster, Soft Shelled Turtle Gets Married, Eats the Stinking Part of the Deer Ankle, White Wolf, The Two Boys, Spear Shaft and Lacrosse, The Shaggy Man, The Thunderbird, The Red Feather, The Birth of the Twins (v. 3), Trickster Visits His Family, The Woman who Loved Her Half-Brother, Redhorn's Father, Old Man and Wears White Feather, Morning Star and His Friend, Thunderbird and White Horse, Rich Man, Boy, and Horse, Shakes the Earth, The Nightspirits Bless Čiwoit’éhiga; someone hears a disembodied voice and only later discovers its source: Trickster Eats the Laxative Bulb, Hare Retrieves a Stolen Scalp, Pete Dupeé and the Ghosts; an animal spirit transforms himself from one kind of animal into another: Bear Clan Origin Myth (bear > blackbird > bear), White Wolf (wolf > dog), A Man and His Three Dogs (wolf > dog), The Dog that became a Panther, The Were-fish (raccoon > fish), Lake Wąkšikhomįgra (Mendota): the Origin of Its Name (raccoon > fish), The Spirit of Maple Bluff (raccoon > fish); something is of a (symbolic) pure white color: White Bear, Deer Spirits, The Journey to Spiritland (v. 4), White Flower, Big Eagle Cave Mystery, The Fleetfooted Man, Thunderbird and White Horse, Worúxega, The Two Boys, The Lost Blanket (white spirits), Skunk Origin Myth, He Who Eats the Stinking Part of the Deer Ankle, White Wolf, A Man and His Three Dogs, The Messengers of Hare, The Brown Squirrel, The Man Who Fell from the Sky, Bladder and His Brothers, White Thunder's Warpath, The Shell Anklets Origin Myth, The Dipper, Great Walker's Medicine (v. 2), Creation of the World (v. 12), Hare Secures the Creation Lodge, The Descent of the Drum, Tobacco Origin Myth (v. 5), The Diving Contest, Otter Comes to the Medicine Rite, The Arrows of the Medicine Rite Men, The Animal Spirit Aids of the Medicine Rite, Grandmother's Gifts, Four Steps of the Cougar, The Completion Song Origin, North Shakes His Gourd, Lifting Up the Bear Heads, Thunder Cloud is Blessed, Peace of Mind Regained. 1 Kathleen Danker and Felix White, Sr., The Hollow of Echoes (Lincoln: University of Nebraska Press, 1978) 38-42. Informant: Felix White, Sr.
2 "The Dun Horse," in George Bird Grinnell, Pawnee Hero Stories and Folk-Tales (Lincoln: University of Nebraska Press, 1961 ) 87-97.